Department information about the Office of Equity and Inclusion. The Mission of the Office of Equity and Inclusion is to Inspire and Equip City Government to make Albuquerque a national role model of embracing diversity as our greatest asset. Invest in city infrastructure and deliver city services in an equitable and inclusive manner. We define inequities as disparities in health, mental health, economic or social factors that are systemic and avoidable and, therefore, considered unjust or unfair. The City of Albuquerque released an Equity Profile of Albuquerque which shows that inequities and disparities are holding the city back and that closing racial gaps in economic opportunity and outcomes is key to our city's future. 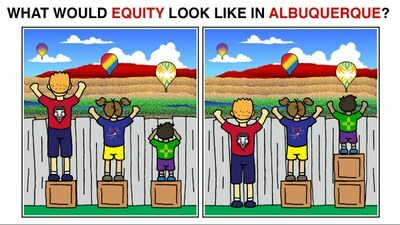 View a summary of the Equity Profile of Albuquerque. We value the full participation of people who are most impacted by inequity in defining the problems and the solutions.